Hydroxycut HD is a supplement made by MuscleTech. It’s designed to help increase your energy levels and boost your metabolism. In this review post, we’re going to take a close look at Hydroxycut HD by looking at the ingredients, comparing it to some other products and checking out some of the customer reviews. Hydroxycut HD forms part of a series of supplements designed to help with your fitness goals and they’re very popular in the United States. What does Hydroxycut HD by MuscleTech do? Hydroxycut HD fits into the broader category of supplements that are designed to help support your goals. These are pills or capsules which are designed to help you get closer to your fitness goals by supporting you as you train hard and stick to a good diet. There are lots of different products on the market these days, and many of them make a lot of claims. Generally, these supplements are formulated to help support you as you take responsibility for your results. Let’s take a closer look at Hydroxycut HD to see where it stands. The first thing that we noticed with Hydroxycut HD was that it contains proprietary blends. This is when the manufacturer chooses to hide the individual doses of the ingredients and include them simply as a wider ‘blend’ of many substances. This is not something we like to see and we were disappointed to find this to be the case with Hydroxycut HD. But now let’s focus on the ingredients that are on the label. • Caffeine Anhydrous – This is one of the most popular ingredients in supplements and is usually one of the first things on the label. We’re always big fans of this ingredient and it was good to see it on the label. 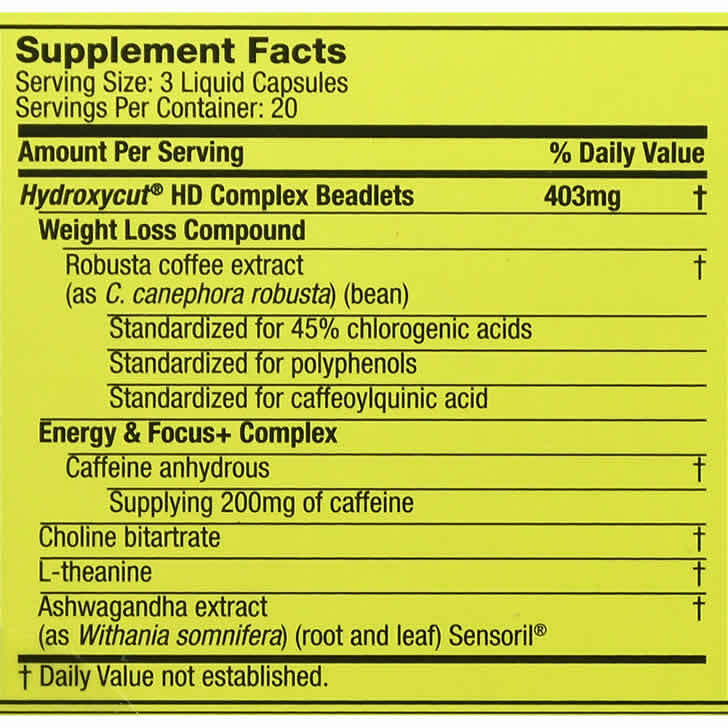 However, each serving of Hydroxycut HD contains 200mg of caffeine, which is quite a lot. • Robusta Coffee Extract – This is another good ingredient and is definitely something we want to see in similar supplements. Essentially, this is green coffee bean extract, meaning that it’s a substance made from coffee beans before they have been roasted. The good thing about this ingredient is that it is a great source of Chlorogenic Acid. It’s good to see this ingredient included in Hydroxycut HD, although it’s disappointing that it’s been hidden in a proprietary blend. • L-Theanine – This is an amino acid which is primarily found in tea leaves. It’s commonly used in pre workout supplements and often paired with Caffeine in the same product. The problem we have with its inclusion in Hydroxycut HD is that the dosage is not stated on the label, meaning that we don’t know if they’ve included enough of it to even be beneficial. • Choline Bitartrate – This is an essential nutrient which your body produces naturally. It’s not the most common ingredient for a supplement of this type, but it’s not the worst either. That’s because Choline contributes to normal lipid (fat) metabolism. • Ashwagandha Extract – This is an interesting ingredient because we haven’t seen it in many supplements before. There are various claims about its potential benefits online. However, we’re not so convinced about this one and we definitely wouldn’t place Cortisol as a crucial ingredient. There are quite a lot of things missing from Hydroxycut HD in our opinion, and that’s why we don’t consider it to be one of the best supplements out there at the moment. Firstly, it was disappointing not to see Green Tea Extract included. This is really one of the first things we look for in a product like this and it was a shame not to find it on the label. It was also disappointing not to see Cayenne Pepper included in Hydroxycut HD in some form. Cayenne and Green Tea are the two main ingredients we look for when rating a supplement like this and, frankly, we wouldn’t consider taking a product which didn’t include them both. The fact that neither Cayenne or Green Tea was included in Hydroxycut HD was very disappointing. It was also a shame not to see things link Glucomannan, B Vitamins and Zinc not included in this product. We always also like our supplements to contain Black Pepper Extract – so this was another notable omission. These kinds of products are generally pretty safe but we definitely recommend checking the label before taking anything for the first time to make sure that you’re not allergic to any of the ingredients. The main thing to bear in mind with Hydroxycut HD is that it contains a significant amount of caffeine. If you’re already a regular coffee drinker, taking this supplement may mean that you’re getting too much caffeine. We’d also recommend not taking this product too close to bedtime, because the caffeine content could affect your sleep. As always, we do always recommend speaking to your doctor before thinking about taking any new supplement for the first time. Each bottle of Hydroxycut HD contains 60 liquid capsules. The label says that you should start slowly and increase your dose to a maximum of six capsules per day. That sounds a bit much to us, and it means that one bottle would only last you for 10 days if you take six a day. They recommend that you use this product in conjunction with a healthy diet and plenty of exercise – which is good advice. We would also recommend not taking this product too close to bedtime because of the caffeine, and would urge you to make sure you’re drinking plenty of water. We found a lot of reviews of Hydroxycut HD on Amazon and most of them were pretty good. One customer explained how they liked the effects of this product and found that it didn’t spark any jitters in them. Another user said that they used the product for an extra energy boost, although they didn’t experience anything else while taking it. However, there were a few negative reviews as well, with some customers claiming that the pills did not work for them. Not really. While Hydroxycut HD comes from a reputable brand, we’re not convinced about the ingredients at all, especially as it’s hard to see the dosages. 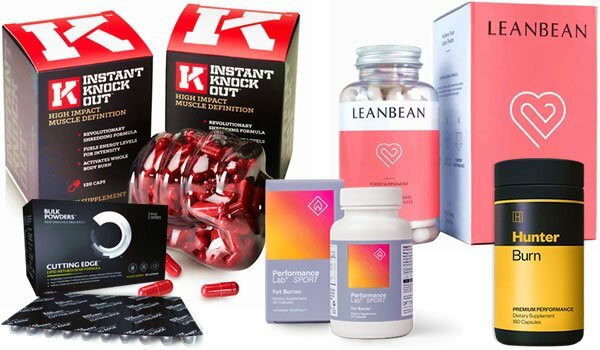 We recently picked out the best five supplements on sale at the moment by comparing the ingredients and checking out the customer reviews. Click the link below to see our list. As we always say when discussing products of this type, there is no ‘magic pill’ when it comes to your body. The main things you’ll have to do is to make sure that your diet and exercise regime is in check. These products are designed to work in conjunction with a healthy lifestyle and you should always make sure that you’re training hard and eating right first. That said, a good supplement can indeed help to support you on your journey as you look to take responsibility for your body. So there we have it, our full review of Hydroxycut HD. We hope that you found this post useful in helping you to make an informed decision about this product. Overall, we’re not too convinced by this supplement and feel that there are definitely lots of better options out there at the moment. This article was last updated on January 04, 2019.